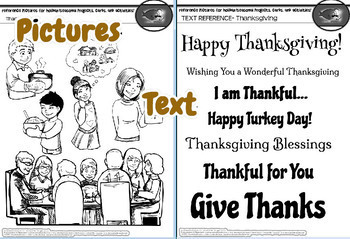 Thanksgiving Card Kit- Text, Pictures, and INSTANT Pilgrim Characters! 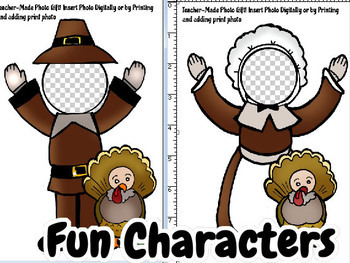 Celebrate Thanksgiving with cards, pictures to decorate bags, and a variety of visuals! Enjoy card-making poems, coloring pages, pictures, text, and photo face characters! Includes original poems perfect for seasonal activities! With all the seasons, holidays, awareness themes, and special school days, a teacher sure has a lot to plan!Let Illumismart make it EASIER for YOU (and your students!) 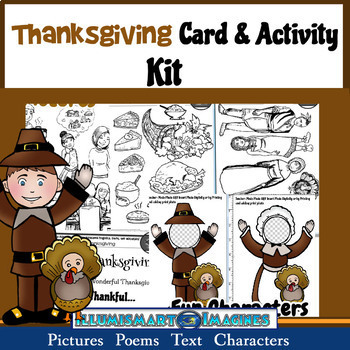 with this Thanksgiving card and activity kit. Get ALL Illumismart's 40+ Holiday and Seasonal Card-Making Kits with the MEGA VALUE Bundle! INCREDIBLE Value! ...or get EVEN MORE in the Poems and Pictures BUNDLE! Check out Illumismart Imagines Seasonal Card-Making Kits here! *Pre-colored Children Characters come with 3 skin tones if required. Characters are cartoon children or animals. Some kits come with coloring pages of holiday characters. 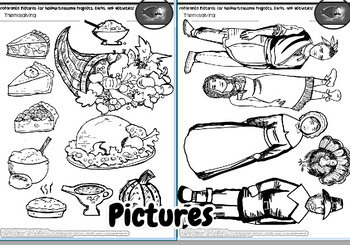 This bundle of visual worksheets (Illumismart's A Year of Card Kits/Thanksgiving) may be used for personal, educational, and non-commercial use. This bundle/images contained is for private/classroom use only. Please consider purchasing Illumismart Clip-Art for your TPT products. Individuals may not remove images from the documents or sell/resell/distribute the clip art individually or in bundled packets. This visual may not be distributed on any site, for profit or non-profit use. Images may NOT be lifted from the pages to use as clip-art. Consider purchasing the clip-art version of the images in this bundle for commercial use! Please respect that the income generated from these worksheets and visuals is VERY important for the needs of my family. As a first time mother with a baby (who left my job to be a full-time mom), I rely on my work-at-home projects. Thank you so much for supporting Illumismart and my family by abiding by these terms. It is greatly appreciated!